As the popular uprising against Hosni Mubarak's three-decade dictatorship in Egypt demonstrates again, political and social conditions in the Middle East can change quickly, and unpredictably. Given that, does it make sense for the world's largest economy to be so dependent on an energy source -- oil -- from a region where a supply disruption is always distinct possibility? One would think not, but that has been this nation's circumstance for a considerable portion of the automobile age. It's only recently that any sign of willingness has appeared for switching to alternative fuels and lowering America's dependence on imported oil. Even with increased domestic drilling, the U.S. wouldn't be able to pump its daily consumption of 18.7 million barrels per day, so the nation has to import fuel to make up the difference. In November 2010, the country imported an average of 8.25 million barrels per day (bpd), about 2 million of which came from Middle East oil producers, according to U.S. Energy Information Administration data. Is there a better energy way -- one that would make the nation more energy self-sufficient and enhance its foreign policy flexibility? There could be, in domestic natural gas. Barring a breakthrough in battery technology, the only domestic energy source that can make a serious run at ending oil's dominance as a transportation fuel in the U.S. in the decade ahead is natural gas. It's abundant, price competitive, cleaner and amply available domesticly. Abundance is perhaps its most appealing advantage. The Potential Gas Committee (PGC) estimated that the U.S. had 1,836 trillion cubic feet (Tcf) of recoverable natural gas as of 2008, out of a total future natural gas resource base of 2,074 Tcf, which would meet the nation's natural gas demand for about 100 years, based on the current consumption rate. Of the 22.8 Tcf of natural gas the U.S. consumed in 2009, 90% was produced here. (Leading producer states: Texas, 30%; Alaska, 12%; Wyoming, 10%; Oklahoma, 7%). And most imports of dry natural gas came from a reliable trading partner: Canada. However, while natural gas has made it to the big time as an energy source for industrial, commercial and residential uses, it hasn't played a large role as a transportation fuel, except for bus fleets and other institutional fleets. One major reason is its lack of compactness. Although large vehicles, such as buses and vans and some trucks, can accommodate the large tanks natural gas requires, small cars and modest-size SUVs can't without displacing volume from features that car buyers desire for other uses -- most often trunk and cargo space. A second issue is the lack of natural-gas filling stations. More are being added each month, but with only 1,100 stations in the U.S., compared to more than 160,000 gasoline stations, gas or diesel are orders of magnitude more convenient. Those two factors probably mean that public policy would have to encourage natural gas fuel use, if its role as a transportation fuel is to increase.Without a significant push from Washington, U.S. drivers are unlikely to ditch their ingrained gasoline habits any time soon, even if gasoline cost substantially more on a per mile basis than natural gas. Targeted assistance could help. New vehicle designs are shifting natural-gas tanks to spots below the vehicle frame -- a more rational location that takes advantage of dead space, leaving the trunk area free. Federal tax policy subsidizing design research would likely speed the development and introduction of new natural gas powered vehicles. A friendly tax policy, along with modest subsidies for natural-gas filling station companies, could also help speed the construction of a ubiquitous station network. Long term, the critical factor for U.S. motorists is likely to be price. Natural-gas critics correctly point out that the current price of natural gas low -- about $2.50 per gasoline gallon equivalent in Los Angeles, and about $2.30 in New York City -- would likely rise substantially if drivers shifted in large numbers to natural gas. 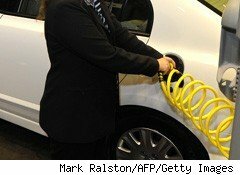 Of the 12 million natural-gas vehicles in use globally, only 110,000 are in the U.S., which has seen their use increase at a 3.7% average rate since 2000, according to industry booster cngnow.com. The natural counterargument is to ask: What's likely happen to the price of gasoline in the years ahead? The International Energy Agency sees global oil demand rising in 2011-2012 as economic expansions continue worldwide. It could be wrong, and demand could unexpectedly drop, putting downward pressure on oil's price, currently about $91 per barrel. But how likely is a sustained oil price retreat, given rising demand in emerging-market economies, such as China? Barclays forecasts that oil may top $100 a barrel in 2011 as global demand accelerates, Bloomberg News reported Thursday. Can the U.S. Depend on International Oil Producers? Still, even a relatively stable or declining price for oil wouldn't eliminate the major liability of U.S. oil consumption: the risk of major supply disruptions. As events in the Middle East have repeatedly demonstrated, oil production in this region is subject to sustained periods of interruption. How high could such a disruption push the price of oil? $150 per barrel? $200 per barrel? And if political instability were to hit a major supplier such as Saudi Arabia, would the U.S. be able to buy enough oil to meet its daily requirement? This is a major economic vulnerability. For that reason alone, wider use of natural gas as a transportation fuel makes sense. Yes, oil will remain an essential fuel in the decade ahead, but in an energy future in which supply reliability may become just as important as price, natural gas could provide an American solution to an uncertain international energy landscape.